Paget-Schrotter Syndrome or Effort Thrombosis: What is the most current treatment? A 41-year-old female presented to hospital with a swollen, painful right upper extremity, which had been progressive over several days. The patient was an avid athlete who performed vigorous upper body exercised on a regular basis. Initial work up including upper extremity ultrasound confirmed right subclavian vein DVT (figure 1). She had no personal or family history of thrombophilia, and screening blood work was unremarkable. Chest X ray (figure 2) did not show evidence of a cervical rib. Based on her presentation a discussion ensued with her physicians as to the best management. Ultimately, given the time frame of the thrombus, of which the acute episode appeared to be only several days time, angiography with possible catheter direct thrombolysis (CDT) was offered to the patient. Angiography noted both acute and chronic features: it confirmed 100% thrombotic occlusion of the subclavian vein at the level of the first rib (figure 3). Additionally there appeared to be collateralization, which had formed allowing for drainage into the SVC. However, given the acute presentation and progressive, significant symptoms, further intervention was attempted. 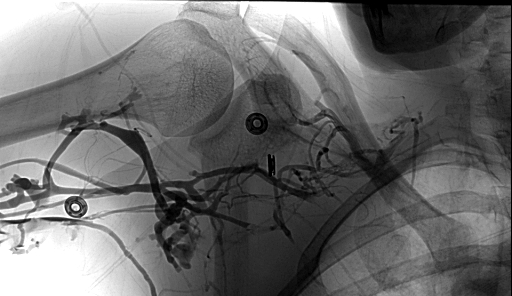 The lesion was crossed easily with an 0.035 stiff angled glide wire, and an EKOS catheter (Ekosonic Endovascular) was placed uneventfully with tPA infusing at 1mg/hr overnight (figure 4). This catheter combines a traditional lytic catheter with side holes, with a tiny ultrasound filament, which is postulated to assist in clot fragmentation. The patient was also treated with adjunctive aspirin and heparin. Repeat angiography 24 hours later revealed some recanalization of the vessel and was treated with adjunctive Angiojet therapy (Medrad) and subsequent balloon angioplasty with a 9.40mm Foxcross balloon (Abbott Vascular). Final angiography revealed the vessel to be fully recanalized (Figures 5-7). The patient was then referred on to Vascular surgery for consideration of rib resection in the setting of this current event. The issue of “effort thrombosis” arises from an anatomical abnormality of the thoracic outlet that predisposes patients to compression of the axillary and subclavian venous system. This syndromes goes by various names including: venous thoracic outlet syndrome, Paget-Schroetter syndrome, “spontaneous” thrombosis of the upper extremity, or effort thrombosis. Congenital features such as cervical rib, extra muscle, or abnormalities of tendon insertion may cause it. Secondary causes can include a fracture at the site, or muscle hypertrophy from repetitive exercise (ie. rowing, weight lifting, pitching). Additionally, extremes of motion, or repetitive motion alone can create a nidus for this condition. Given this, the presentation is most commonly seen in young, athletic patients. Physical exam will be remarkable for swelling of the affected extremity, however, based on the chronicity of the process, one may appreciate the formation of venous collaterals on the upper chest of the affected side (Urschel’s sign). Depending on the severity of compression, features of brachial plexus compression may also be present. Evaluation and examination should include careful assessment for the possibility of pulmonary embolism progressing from this condition. As mentioned in the above vignette, imaging is essential to the diagnosis of this condition. CXR is helpful to rule out obvious anatomic causes however, sometimes until the patient undergoes surgical exploration, the immediate anatomic cause is not readily apparent. Vascular ultrasound is extremely helpful in solidifying this diagnosis, with angiography still as the gold standard for assessment. If no apparent anatomic cause is found then consideration of screening for thrombophilia or malignancy is warranted. A departure from the guidelines? Given that this is a less common presentation of DVT, there have been no randomized trials evaluating different treatment algorithms for this disorder, leading much of the management to case reports and expert opinion (1). Given these controversies this area remains rich for further study. However current expert consensus recommends an aggressive strategy in this young, active patient population. It is hoped that future guidelines will seek to address a more unified consensus opinion than the current anticoagulation guidelines. Illig KA, Doyle AJ. A comprehensive review of Paget-Schroetter syndrome. J Vasc Surg. 2010 Jun;51(6):1538-47. Kearon C, Akl EA, Comerota AJ, Prandoni P, et al. American College of Chest Physicians. Antithrombotic therapy for VTE disease: Antithrombotic Therapy and Prevention of Thrombosis, 9th ed: American College of Chest Physicians Evidence-Based Clinical Practice Guidelines. Chest. 2012 Feb;141(2Suppl):e419S-94S. Urschel HC Jr, Patel AN. Surgery remains the most effective treatment for Paget-Schroetter syndrome: 50 years’ experience. Ann Thorac Surg. 2008 Jul;86(1):254-60. Figure 1. Right upper extremity ultrasound doppler signal at the level of the mid subclavian vein demonstrating loss of phasic flow suggestive of more proximal obstruction. Figure 2. Chest X ray demonstrating normal rib structure. Also noted is correct placement of Ekos catheter around the area of thrombus and extending into the SVC. Figure 3: Digital subtraction angiography (DSA): performed via 4Fr glide catheter demonstrating occlusion of proximal right subclavian vein with collateral drainage into SVC. Figure 4. Positioning of Ekos catheter around the thrombus and extending into the SVC. Figure 5. Repeat DSA 24 hours after therapy demonstrating recanalization of vessel. Figure 6. Balloon angioplasty with 9.0x40mm Foxcross balloon. Figure 7. Final angiography after lytic therapy, Angiojet thrombectomy and balloon angioplasty demonstrating successful recanalization of vessel and diminution of collaterals.